Making snow penguins taught me a novel way to color snow. My solution for giving this snow sculpture some color is tangentially related to baking; it involves the creative use of food coloring. 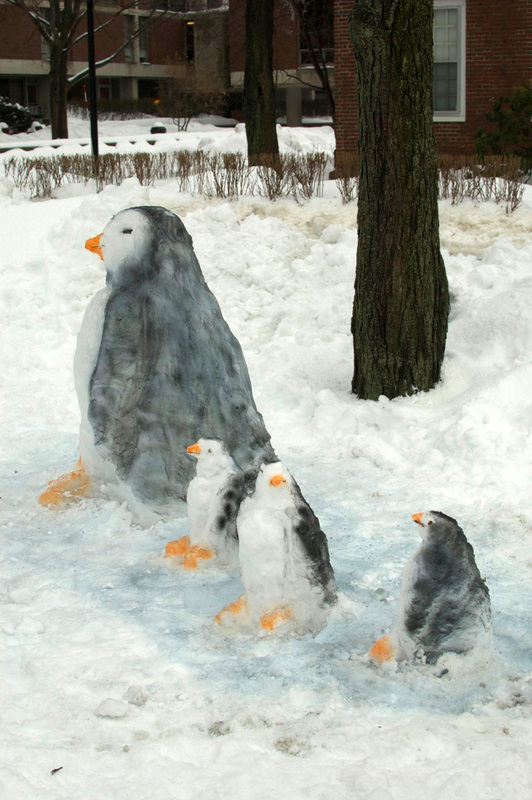 I had some unexpected free time due to bad winter weather, and I made these cool but easy snow sculptures. I'm calling it "Make Way for Penguins," a play on the Make Way for Ducklings statue in downtown Boston, Massachusetts. I spent about an hour making the large snow penguin . . . in the freezing rain. I stacked snowballs into a pillar and started carving away with a crowbar. I could have used a trowel, shovel, and a few more tools for sculpting, but didn't have any on hand. After being completely drenched by freezing rain, I took a break. 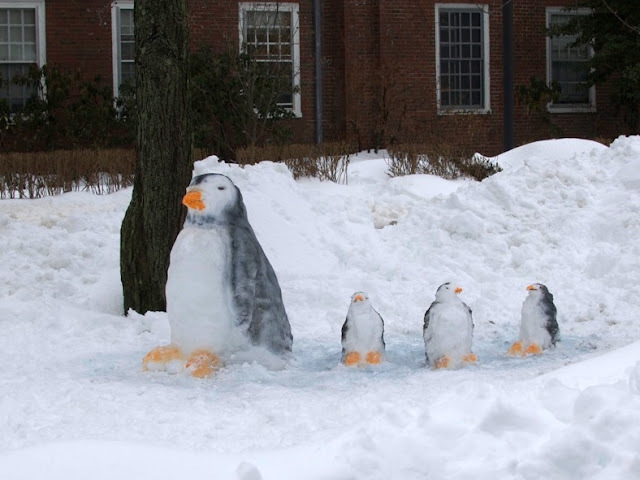 I waited for the rain to stop, hoping I'd be able to make a few little snow penguins to go with the big one. Although the snow was good for packing when I made the large snow penguin, it became crunchy and tough to pack after the rain fell and froze. I cobbled together ice chunks for the little snow penguins, so I wasn't able to shape them as much as I would have liked. On a positive note, I think it makes them a little charming. Other people liked it, too: the Harvard Crimson wrote a short piece about it. I mixed professional food coloring gels with water in some empty spray bottles to color the feet, beaks, and the blue "ice" they are standing on. I tried using black food coloring for the penguin's coats, but it turned blue after a few minutes, perhaps as it melted slightly into the surface and became diluted. 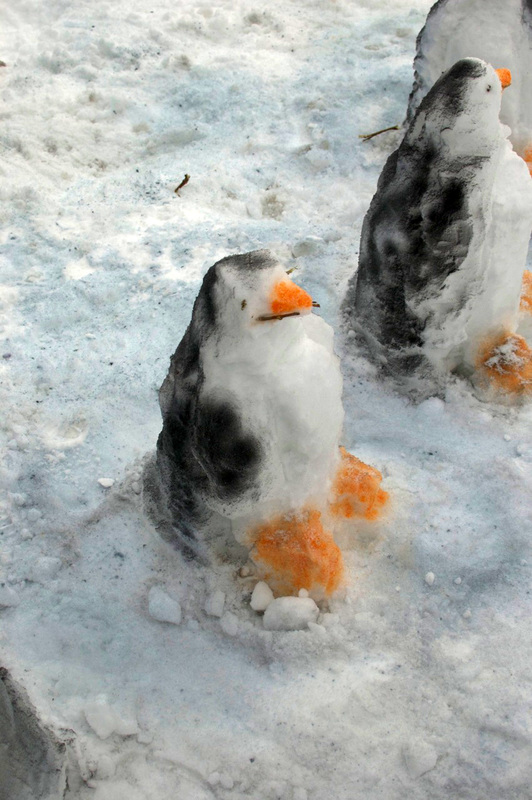 The penguin coats are colored with a very thin layer of black spray paint over the initial layer of black food coloring. Not the best solution. Any suggestions for an environmentally safer black dye? Maybe soil particles, coco powder, or powdered coffee? 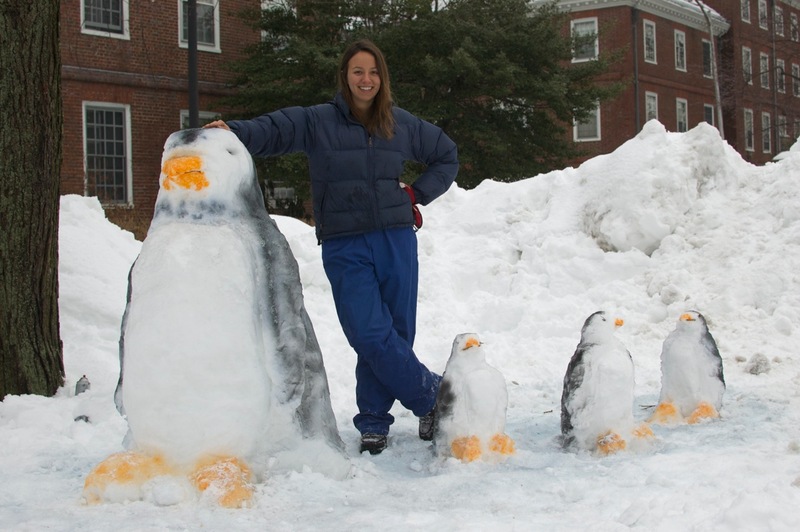 Make Way for (snow) Penguins! I promise there is another food post on the way: chocolate cake with a delicious secret ingredient! HAHA! This is sooo cute! 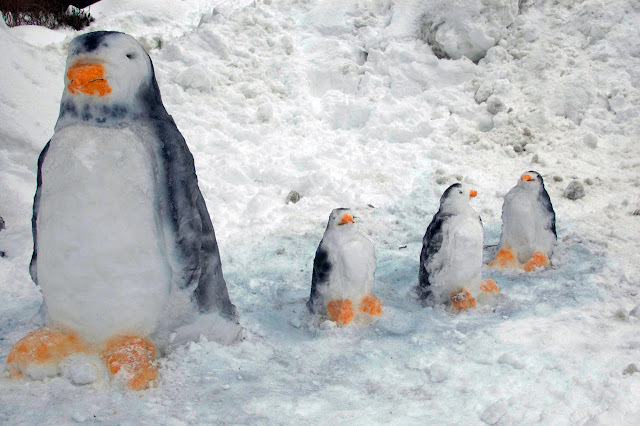 I'm thinking I want to get out there today and make those penguins! Very Cute! Thanks! These were a blast to make, and tons of people of the course of the next week took "portraits" while hugging the big penguin. It was super cute! !